Pedestrians walk through a busy, bottle-necked path on Tuesday as construction on the adjacent areas of the Science Center plaza continues. Construction is underway to transform the Science Center Plaza into a dynamic social gathering site that will accommodate more seating, events, and local engagement for the Harvard community. The project, which commenced last May, is part of Harvard’s Common Spaces program and is taking place in tandem with Cambridge’s structural renovation of the Cambridge Street tunnel’s roof and drainage facilities. 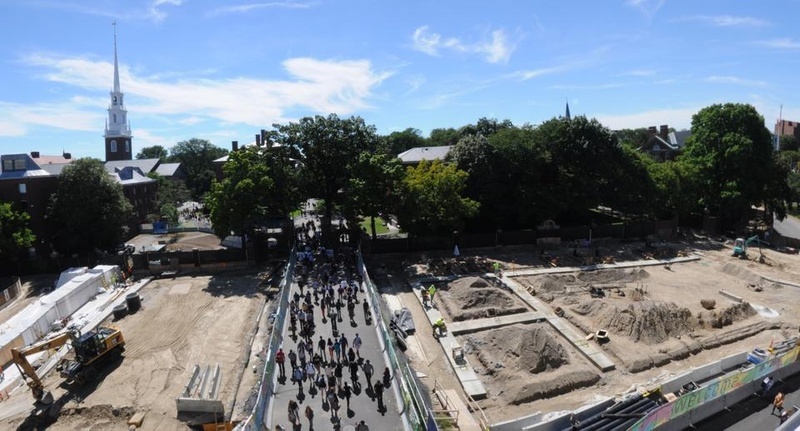 “The goal of the project…is to transform the site from a pedestrian walkway into a vibrant meeting space for Harvard students, faculty and staff events,” said Faculty of Arts and Sciences spokesperson Jeff Neal in an email after declining to comment by phone. Trees will be planted to provide shade around the Science Center and near the entrance to Memorial Hall. The plaza lawn and stones of the Tanner Fountain will be refurbished. Fixed benches and movable tables and chairs will be placed in the area to accommodate campus programming such as performances and winter skating, or daily activities like meals from Science Center food trucks. New lighting fixtures and bike paths will also be put in place to enhance safety and access for pedestrians and bicyclists in the plaza. Many students travel through the area late at night to reach Annenberg Hall or commute from labs to dorms. “I’m glad that they’re improving access within the plaza,” said Lily H. Ostrer ’14, adding that there wasn’t a great way for bikers and pedestrians to navigate the space. Plans for the space also emphasize environmental sustainability. Recycled porcelain will be incorporated in the pavement and information kiosks using solar-powered displays will announce news and events to the community. In the next few months public access to the plaza will increase and regular programming will steadily return as construction progresses. Students look forward to a new hub for relaxation and engagement. “I think it’d be great to have a space to relax, enjoy food, and study. I’d really like to see the construction gone,” said Michael Constant ’16. Construction of the plaza is expected to be completed by next summer.